What you have with the AMD Radeon Pro WX 8200 workstation graphics is a very affordable piece of visual hardware that retails for just $325.25 which you can at this moment purchase on Amazon. Sporting its signature YInMn color scheme the Radeon Pro WX 8200 main intent is to attract builders who plan on using their rigs for creative content such as video and image editing. Now, this particular iteration regarding specs is slightly a step down from the current flagship variant which is the Radeon Pro WX 9100. But I'm not trying to sell you a graphics card, I more interested in the internal components. As usual with Hardware Breakdown, let's use our imagination and get out the virtual tools and crack up the Radeon Pro WX 8200 and examine its core components, what makes this particular graphics card so uniquely attractive to hardware pundits such as myself. In lifting casing off this graphics card you'll find its constructed entirely on Vega GPU architecture, its lithography or the processing die is 14nm FinFET, the card is capable of producing 3584 stream processing, 56 compute units that push up to 10.8 teraflops on a single precision performance, and 21.5 TFLOPs of half-precision (FP16) performance. On the memory front, the Pro WX 8200 holds 8GB of HBM2 memory that's linked directly to the GPU over a 2,048-bit interface, and there's also ECC support ensuring accuracy during full operations. The graphics cards memory bandwidth comes in at a hefty 512GB/s, a level up over the higher priced variant; the WX 9100's have a 484GB/s memory bandwidth. Radeon Pro WX's higher price is attributed to it having 16GB HBM2 memory. With memory being lower in comparison, this explains the dip in price point. 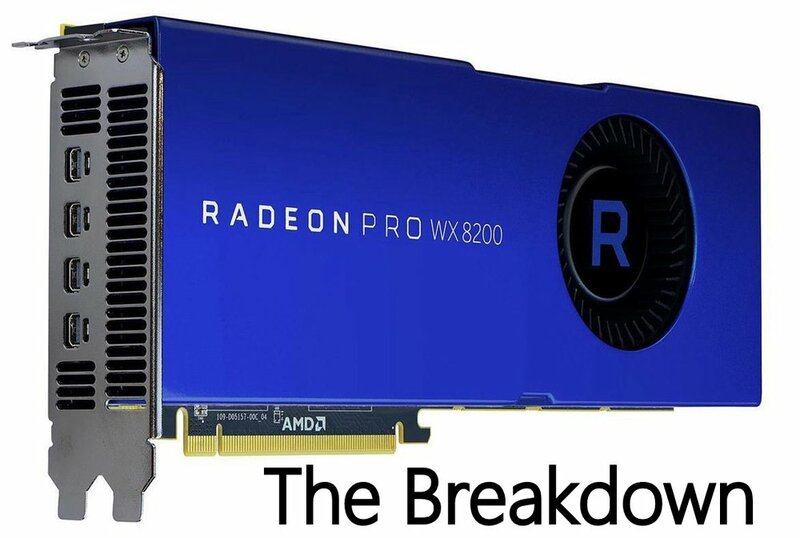 Like all the Radeon Pro WX line, the 10.5-inch long WX 8200 come outfitted with a single blower cooler shrouded with an attractive blue color scheme with just the model number present on the card. The graphics card will consume two-slots and will require PCI Express power feeds which is 6-pin and 8-pin connector. The card max TDP is 230W, this means you'll need an adequate power supply at minimum 650 watts. Impressive graphics card to say the least, will the features and specs l I provided in this post entice you to purchase this piece of hardware for your next PC build? The reasonable price point will certainly attract potential buyers. Tell me what you think. Drop a comment in the box. ECC is acronym for error correcting memory which is primarily stored data that can detect and correct common kinds of data corruption.